Club Penguin Cheats by Mimo777 Club Penguin Cheats by Mimo777: We Broke A Club Penguin Record! Breaking news! You. Me. And all our friends broke a Club Penguin record! Cp had over 1.8 MILLION Penguins log on during the last 24 hours! Whoa! There are some glitches going around because of the record but it'll be ok. The Cp team is working hard to fix everything. And, if you haven't defeated Herbert yet there is still time! So get geared up and get out there! What would you rate this party compared to ALL other parties on a scale of 1 to 10? If this isn't the best party ever, what is? This party was probably a 7 for me. My fav's were the Summer Kickoff Party of '07, the Cove Opening, Camp Penguin and of course the Water Party of '07. 6 because there were glitches in the part. My favorite is a party from a long time back which is the Marathon Party were you had to run around the whole Island and got a medal at the end. Ya great party a little long because its not ending for another 9 days : ( but iwould rate it a ( out of 10 the suspense of whats next and the BIG secret of Aunt Arctic OMG it was AMAZING! So happy!! anyway waddle on cpg!! This party is really different, but it reminds me of the old EPF missions! So I rate it 8/10. 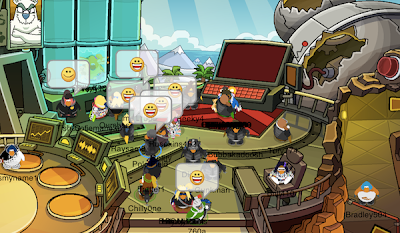 Nothing can beat CP's old Christmas or April Fools Day Parties! Three words. Festival. Of. Flight. I'd rate this party 8/10. It's fun, new and gives all players a full set of agent gear (very generous), sure, but there were a lot of glitches and for a while I couldn't even enter Herbert's base. My favorite parties were the 2008 Fiesta, the 2008 Sub Marine party and the 2007 Water party. My favourite party was the Festival of Flight. It was so cool, plus if your were a member you could get the jet pack! The favorite part for me, was defiantly when the snow pilled up. It reminded me of the early Christmas parties. So, for me, 8. Halloween 2007 was the best. EVER. And the St. Patricks party that year was amazing too! And there was one party, I forget the year, probs 2007 or 2008 where the crab broke the glass in the underground and the town flooded. that was fun. And I can't forget the April Fool's party of 2007. OMG HOW TO CHOOSE? AND THEY SAY THE RATINGS ARE GOING DOWN. CONGRATS CP! You deserved it! This was not only, imo, the greatest party of all time, but the most impactful. Oh and Grande pie, duh we are going to have SNOW JITSU!!!!! My favourite party of all time on Cp was when (and I joined in late 2008) they did the St. Patrick party in 2009 but from there on it just when all down now NONE of the parties are fun. And 5/10 for operation black out, its too much like field ops. And I dont really like field ops, i like the old cp WAY better.